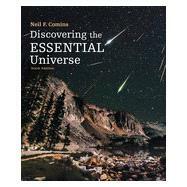 Neil Comins’ Discovering the Universe confronts the challenges of the one-term astronomy course by heightening student curiosities about the cosmos, by using the context of astronomy to teach the process of science, and by highlighting common misconceptions and showing students how to think their way past them. With its signature combination of vivid writing and spectacular images, the new edition offers new findings, new study help, and an expanded new media/supplements package centered on W.H. Freeman’s breakthrough online course space, LaunchPad. Neil F. Comins is a professor of physics and astronomy at the University of Maine and author of popular scientific books, articles, and textbooks. He earned a Bachelor of Science degree from Cornell and a Ph.D. in astrophysics from University College, Cardiff, Wales. He is the author of What If the Earth Had Two Moons?